Pay per click advertising is the one of, if not the, most used form of online advertising out there. There are many reasons for this. For example, it could be because Google have made such brilliant programs being AdWords and AdSense. However, whatever way you look at it, the main reason is because it works for advertisers and publishers alike (compared to competitors like banner advertising). If you browse through the articles on PPC.org, you will find many many articles that can help advertisers and publishers alike with PPC. However, I don’t think there is an article that looks at PPC from just the web user’s point of view. For this reason, I thought it would be a good idea to look at PPC from a different perspective other than the advertiser’s or publishers. 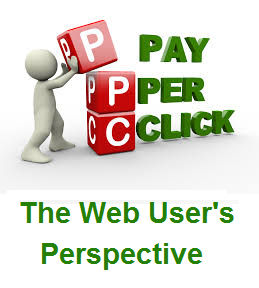 Here is the journey a web user will take through pay per click advertising. The first step to the web user’s journey consists of using a search engine. The reason for using the search engine will vary. She/he may want to find out something, research a topic, buy a product or service or find a specific brand. Upon loading the search results, in split seconds, advertisers of PPC will be bidding to show their adverts on this web user’s search results. Depending on what the web user searches for depends on what advertisers bid to show their advert and at how much too. Whatever advertisers bid the highest, their adverts will show on the search results above the organic results. The webpage has loaded by now showing up to three adverts above organic results (with many more in the right hand side column). This is where the competition increases as each advertiser wants the web user to click on their advert. A this point, a well optimised advert will get the click. From looking at the adverts and seeing how it relates to what the web user searched for, the web user clicks on one of the adverts. Upon clicking on the advert, the advertiser will have paid a CPC to Google for gaining that paid search traffic. At this moment in time, the web user will now be sent to the advertiser’s designated landing page to hopefully finish up with a conversion. The landing page has to suit the web user’s needs and appeal to them in order to successfully gain a conversion (a boring landing page will gain a high bounce/exit rate). After looking at the landing page and scrolling through information, depending on what type of landing page the advertiser has used, the web user will then have a decision: to either exit the page since they are not interested enough to convert or convert. From looking at pay per click advertising from the web user’s point of view, one thing that has been made quite clear to me is the amount of work that goes on in PPC behind the scenes in split seconds. On the surface, PPC is incredibly simple: show adverts that relate to what the web user searched for, they click on the advert and do an action which counts as a conversion to the advertiser. However, beneath the surface, there’s competition, a furious bidding war, redirecting URLs, algorithms and more.